"Life is not easy for A-han-zi. She must choose between yielding to the wishes of her father, chief of her Sioux tribe, or following her heart to learn the secrets of healing from the village mystic. When a white man is found badly wounded near the village, A-han-zi finds herself as his caregiver. Their two lives become intertwined, changing their paths in ways neither expected. "Can A-han-zi's healing power restore peace in her own heart and heal the conflict around her?" This is a story about discovering what is really important in life: growing, adapting, and accepting others for who they are. It was written by L.M. 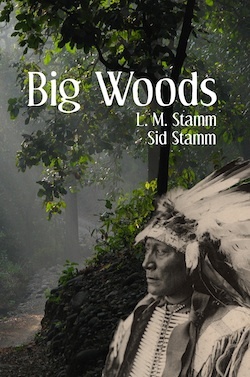 Stamm in 1996 and then lost for years until his son Sid rediscovered the partially finished manuscript. In March 2010, the author was diagnosed with a rapidly progressing form of cancer--a fork in the road that abruptly brought his and his son's dreams to the forefront. Knowing he had become distracted from his writing for the past ten years, and driven by the pride seen him take in his stories Sid set out to put his words into print. He died in May 2010, but lives on in his writing. Any royalties received from sales of this book will be donated to cancer research funds in hopes that other fathers out there with a story to finish will someday get their chance. This work is published with the sole intention of seeing his words finally in a finished form; this story's content is provided to you under a Creative Commons Attribution-Noncommercial-Share Alike 3.0 United States License that allows you to freely share this work and any derivatives you might want to make, so long as they're distributed for noncommercial purposes. All that is asked is that you acknowledge the part of the authors reflected on these pages and retell this story to those who will listen. Chief Hollow Horn Bear image from Boston Public Library, used under CC BY 2.0 license. Corbett park image from netlancer2006, used under CC BY 2.0 license.